Swap! | What is ML Reading? Which brings me to the book, Swap! by Steve Light. It’s a delightful book every teacher should own. It teaches economics in a fun, easy to understand way. The illustrations are exciting. It’s the first book I’m adding to this year’s Mock Caldecott 2017. 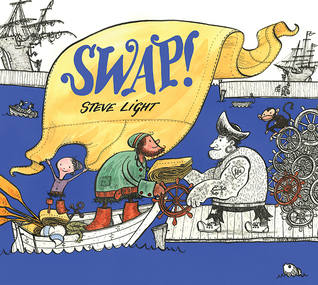 It’s best described by it’s publisher, Candlewick Press, “In a young scalawag’s first tale of bartering, a peg-legged youngster sets out to help his captain repair his vessel. One button for three teacups. SWAP! Two teacups for four coils of rope. SWAP! And so it goes, until the little swashbuckler secures sails, anchors, a ship’s wheel, and more . . . including a happy friend. Steve Light’s intricate pen-and-ink illustrations, punctuated by brilliant blue and other hues, anchor this clever tale of friendship and ingenuity. This entry was posted in Picture Book and tagged Steve Light, Swap! by mlreads. Bookmark the permalink.